The Bengal house cat comes in different colors and patterns. The most popular color variation being the brown tabby. The following are some of the accepted color and pattern combinations for competition. Note: For this article I’m using the TICA breed standard). Interestingly, in Bengal house cats, the color brown encompasses several shades of brown – from near-black to gorgeous tones of bronze, copper, gray, gold, and rich fawn. You will also find silver and "snow" Bengals, which have a creamy-white color under their spots. There are, of course, some colors that are not accepted for competition. These colors are rare, too. What are these unrecognized colors? The only accepted patterns for competition are the spotted and the marbled. Spotted pattern. 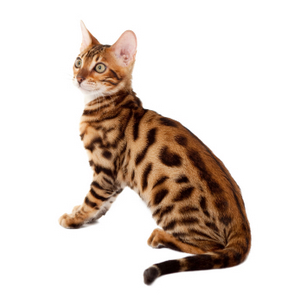 It consists of distinctive spots and rosettes, giving Bengals a leopard-like appearance. In this pattern, rosettes should be of two clearly defined shades. Spots can be large or small. They can also be random or arranged horizontally. Marbled pattern. The marbled pattern showcases dramatic swirls and diagonal lines. It resembles the beautiful patterns of marble stone, hence the name. Glittering. Some Bengal cats appear as if gold dust has been sprinkled all over their bodies. This opalescent shimmer gives these felines a unique look. This trait is not a Bengal marking per se, but it is worth mentioning. TICA states that eye color in the Bengal house cat is independent of coat color, except in the lynx points. Lynx point Bengals should have blue eyes. The eye color in Seal Minks and Seal Sepias can be copper, green (aqua) or gold. The acceptable coat length for Bengals is short to medium. Occasionally, Bengal kittens with slightly longer hair are accepted for competition. It is rare to find long-haired Bengal cats, but you will find them. Learn more about Bengal domestic cats. This article explores the history, evolution, and behavior of Bengals. Snow Bengals. Information about these unique felines. Pictures of Bengal cats. These images make wonderful cat lover gifts. Bengal cat photos. More pictures of the striking Bengal cat.